The book charts the dramatic months leading to one of the most profound changes of the 20th century, the opening of the Berlin Wall in 1989 and the restoration of German unity in 1990. 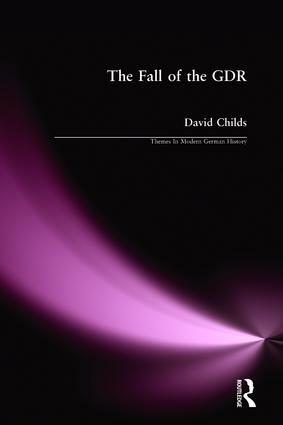 The author analyses the nature of Communist rule in the GDR over 40 years, its few strengths and its many weaknesses, and the myths which grew up around it. This book places the GDR in its international setting as the proud ally of the Soviet Union in the Warsaw Pact. It examines the reactions abroad to the unfolding revolution. The text is based on a wide variety of written sources and many interviews with leading Communist figures, such as Krenz and Modrow, and with their opponents and successors, and former Stasi officers and the dissidents they tried to crush. It greatly benefits from the author's decades of involvement with East Germany, including personal friendships there, before 1989 and his eye-witness accounts of many of the events during Die Wende. It should be of interest not only to students of German politics, contemporary history and the Cold War, but to all who are curious about the momentous times through which we have lived. The 6DR in 1988 - a stable state?